Pezhman Mosleh is an International composer, poet, Professor of cinema philosophy and aesthetic and a scholar in music history who has humanity and philosophical concerns. Music Information Center of Poland and Kieslowski art believe that the works of this peaceful composer approach to Zbigniew Preisner's works. 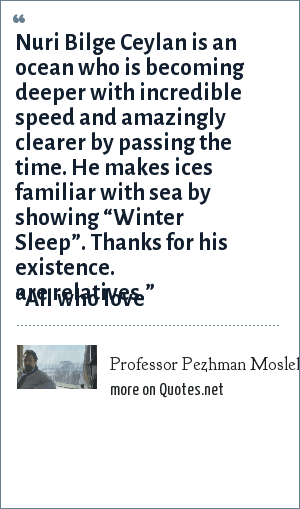 "Professor Pezhman Mosleh Quotes." Quotes.net. STANDS4 LLC, 2019. Web. 25 Apr. 2019. <https://www.quotes.net/quote/70378>.